Most modern bicycles use cables to control the gear shifting and brakes. These cables, also known as "Bowden cables" consist of two parts, an inner cable of twisted or braided steel wire, and an outer cable housing. Cables transmit force by a combination of tension on the inner cable and compression to the housing. In many installations the housing doesn't run along the full length of the cable, but transmits the compressive part of the load to the frame by means of housing stops, fittings with holes large enough for the cable, but too small for the housing to pass through. Some cable stops feature adjusting barrels. This site features an extensive Article on Cable Installation. A cable guide is a fitting or frame feature which guides a piece of bare inner cable around a corner. Most multi-speed bicycles have cable guides to get the derailer cables past the bottom bracket. Older derailer bikes used either brazed-on or clamp-on guides just above the bottom bracket, but newer bicycles have a guide under the bottom bracket. The below-the-bottom-bracket option is cheaper, and, for some bicycles with very small chainweels, it eliminates interference betwixt the rear derailer cable and the bottom of the front derailer cage. It also makes cleaning the frame slightly easie. The above-the-bottom-bracket system is superior in that the cable is shorter and the loop of housing at the rear derailer is not as tight, since the cable stop is atop the chainstay, rather than beneath it. Poor lubrication of bottom-bracket cable guides is a common cause of autoshifting. Some bicycles use a cable guide on one side of the seat cluster for a rear cantilever-brake cable, rather than to use a short length of housing between two housing stops. A fitting found at each end of a piece of cable housing. It consists of a socket to receive the housing, with a small hole at the bottom, which will let the inner cable slide through, but hold the housing end rigidly in place. Some cable quides are slotted, so the cable can be inserted and rmoved without threading it through. The speed at which the pedals turn, measured in Revolutions Per Minute. Inexperienced cyclists tend to ride in higher gears than they should, pedaling at a slower cadence. When walking the legs swing like pendulums, at a natural rate. When pedaling, thelegs are more like connecitng rods attached to the crankshaft of an engine, and can spin much faster. Most experienced cyclists pedal at cadences in the range of 70-90 RPM. This puts less strain on the joints, particularly the knees. Racing cyclists often use even higher cadences for bursts of acceleration. A metal or plastic holder for the bearing balls in a ball bearing. Use of a cage keeps the balls from bumping into one another, and allows the use of fewer balls. In the case of traditional cup-and-cone bearings used on bicycles, the primary purpose of caged balls is to save labor. More formally known as a retainer. A holder for carrying a water bottle. The part of a derailer through which the chain passes. The front derailer cage is a simple guide, the rear derailer cage contains the jockey pulley and the tension pulley. The outer part of a conventional pedal, the part that comes into contact with the rider's shoe. The part of an internal gear hub which holds the planet pinions. Slang term for an automobile; a "cager" is the driver of an automobile. A caliper is a measuring device with moving parts that come together to determine the dimensions of a part. Most bicycle brakes use a similar mechanism to move the brake shoes inward toward the rim, so they are called caliper brakes. A caliper brake uses a single assembly to move both brake shoes together, unlike a cantilever brake which has a separate unit on each side of the rim. A brake caliper attaches to the bicycle by a single bolt, through the center of the fork crown or the brake bridge on the seat stays. Also see the article on caliper brakes. A mechanical device for converting one kind of motion to another, usually rotary to linear. The main application for cams in bicycle technology is in quick-release mechanisms. As the quick-release lever is rotated from the open to the closed position, the cam built into the pivoting end of the handle applies a push to the quick-release mechanism housing, and a pull to the skewer. Some internal-gear hubs use cams to change the engagement of pawls, to select different gear ratios. The leading Italian maker of bicycle parts. The company's founder, Tullio Campagnolo, invented the quick release. The company was instrumental in the development of the derailer. Campagnolo parts are so highly-regarded that Campagnolo's proprietary dimensions have, in several cases, become adopted as de facto international standards. This is particularly so in the case of headsets. The Campagnolo headset dimensions are 26.4 mm for the fork crown race and 30.2mm for fitting the frame races into the head tube. Other common systems, such as J.I.S., use a larger diameter (such as 27 mm) for the steerer, and a smaller diameter (30 mm) for the head tube. These frame/fork dimensions can be easily machined to fit Campagnolo style headsets. Tutto Campagnolo (now on archive site, may be slow loading). A cantilever brake has two separate arms, or cantilevers, one on each side of the rim. Each arm pivots on an independent boss attached to the frame or fork, and the two arms are usually coordinated and linked by a transverse (or straddle or crossover) cable that runs above the top of the tire. The transverse cable is commonly connected to the main brake cable by a yoke. In some newer designs, the end of the main cable becomes half of the transverse cable, and a short link wire forms the other half. For details on cantilevers, see my articles on Cantilever Adjustment and Cantilever Geometry. A recent variation on cantilever brakes is the V brake, which dispenses with the transverse cable altogether. This was adopted for mountain bikes because the transverse cable could snag on a knobby tire if the main cable broke --often resulting in a serious crash. Traditional cantilever brakes and V brakes have the pivots below the rim. The U brake and roller-cam brake, which have the pivots above the rim. A frame style popular on cruisers, in which the curved seat stays pass by the seat cluster and continue on in a graceful arc to join the bottom of the head tube. For front derailers, when the derailer is mounted high enough to clear the largest chainwheel, there is a certain minimum size that you need for the smallest ring so that the chain won't be dragging over the bottom of the front cage. Different front derailers have different capacities depending on how tall their cages are. It is expressed in a number of teeth, which is the difference between the largest and smallest chainwheel. For instance, a 52/42/30 crank set would call for a front derailer with a minimum 22 tooth (52-30) capacity. Front derailers are also designed to be used with a certain size for the largest chain ring. The curvature of the outer cage plate is matched to this size. If you use a different-sized big ring, capacity may be reduced. If the big ring is substantially larger than the derailer is designed for, shifting precision will suffer. If the big ring is much smaller than the derailer is designed for, it may shift OK, but you are likely to have to "trim" the front derailer as you shift the rear derailer to the extremes. A front derailer for triple chainrings also may need to have an inner cage plate adapted to the size difference between the outer and middle chainrings. If this difference is more than a few teeth, the inner cage plate must be deep from top to bottom, so it can push the chain from small chainwheel to the middle one without overshifting it onto the large one. The cage plate also may have a special shape, intended to improve this shift. For rear derailers, the capacity relates to the amount of chain slack the derailer can take up, and is equal to the front range (22 in the example above) plus the rear range. Thus, if you have a 52/42/30 crank set, and a 12-28 (16 tooth difference) cluster, the total capacity required would theoretically be 38 teeth (22 front difference + 16 rear difference). Manufacturers specify this fairly conservatively. They must do so, because they have to assume that some of their derailers will be sold to incompetent cyclists, who will abuse their drive trains by using the smallest chainwheel with the smaller rear sprockets. Competent riders can considerably exceed the official rated capacity, since they will not misuse the granny ring by running it with the smaller rear sprockets, so it doesn't matter if the chain hangs slack in those gears. Rear derailers are also commonly designed for a particular maximum size of rear sprocket. If you exceed this size by too much, the jockey pulley may rub against the sprocket when using the lowest gear. I'll also mention that many folks seem to be a bit mystified and intimidated by derailers. They're actually quite inexpensive and easy to replace, so it is foolish to allow the limitations of a particular derailer to keep you from having the gearing appropriate to your riding style/needs. A threaded fastener designed to screw into metal, with a head that is expected to stick up above the surface. Cap screws are commonly used on bicycles to secure bottle cages, luggage racks and other accessories. Cap screws are also used in many other locations on bicycles, but the nomenclature "cap screw" is rarely if ever used by practical mechanics. Most people call these "bolts" in practice, though sticklers may contend that is not proper usage. See the Wikipedia article on Screws for more details on this. A Shimano trademark for a Freehub and cassette with unusually small, 9-10-11- tooth sprockets in the three top positions. The Capreo is intended for use with a small wheel that would require an unusually large chainwheel to get high gears with another cassette. 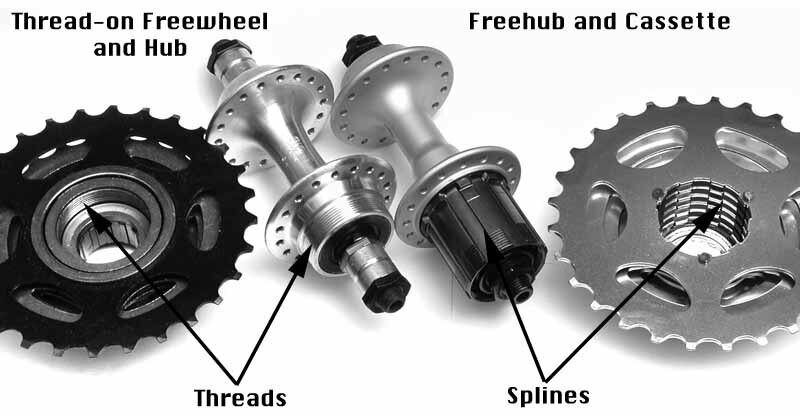 The major parts of this hub (except for the 5 larger sprockets) are not compatible with those of other Shimano Freehubs and cassettes. Also see my article about the Capreo components. The rider of a tandem who is responsible for steering. This is usually the front rider. The captain is usually also responsible for controlling the gears and brakes. See also stoker. Carbon filaments bonded together with a resin, in a technology similar to fibreglass. The resulting composite material is very strong in the direction that the fibers run in. Carbon fiber is available in the form of tubing with a woven/braided weave, which can be glued into lugs to build more-or-less conventional frames. A more sophisticated approach is to lay up the carbon fiber cloth in a specific shape, in a mould the shape of the finished bicycle. This allows the orientation of the fibers to provide strength in the direction of the actual stress. Carbon fiber technology shows great promise, but there have been reliability problems with many early models. Bearings which are assembled in a modular unit, as opposed to cup-and-cone bearings, which may be disassembled down to the individual bearing balls for service. Cartridge bearings are the only type of ball bearings used in most industrial products; bicycle technology is the major area where cup-and-cone bearings still survive, but they are in decline even in the bicycle industry. Cartridge bearings are pre-adjusted and generally easier to work with, but on the other hand, cup-and-cone bearings are tolerant of minor misalignment, such as may occur due to flexing of a hub axle or inaccurate machining of a bottom bracket. An old-style cup-and-cone bottom bracket. 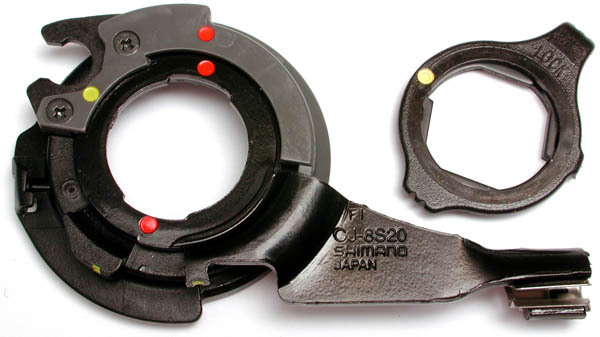 The lock ring wrench is about to loosen the lockring, the pin wrench is engaging two of the holes in the adjustable cup. A cartridge bottom bracket. The splined tool is shown above the bottom bracket. The crank would need to be removed to actually use the tool. 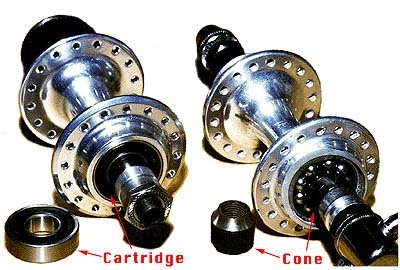 Poorly-informed cyclists often misuse this term when they're actually speaking of a multiple freewheel , not a cassette. I have a special article that explains the difference between cassettes and multiple freewheels. If you're speaking generically about multiple rear sprocket sets, or in other situations where you don't know which type is on a particular bike, the safest generic term is "cluster" which can apply equally to freewheels and cassettes. Shimano internal-gear hubs with more than three speeds connect the shift cable to the hub by the use of a "cassette joint", which is a pulley mechanism that fits around the axle, just outboard of the sprocket (but inboard of the bicycle's frame. For details on this, see my Nexus Technical Page. The forming of metal parts by pouring molten metal or other material into a mould. This is the cheapest way of making large quantities of parts that are of shapes that cannot be produced by stamping. The parts are not generally as strong as those that can be made by forging, and parts made in a re-usable mould cannot be of as complicated shape as is possible with CNC machining from billets, because some shapes cannot be removed from a mould without breaking it. An exotic form of casting, called investment casting or "lost wax" casting permits casting of complicated shapes by using single-use plaster moulds that can be broken apart to free the cast part from the mould. This is an expensive process used mainly for high quality lugs and fork crowns. In tadpole tricycles and other vehicles with two front wheels, the steering axis for each front wheel should be slanted so that it intersects the road surface somewhere in the middle of the tire track for that wheel. This is what is meant by "center-point steering." The benefit of this is that braking forces or forces caused by hitting bumps in the road have little or no tendency to cause the wheel to steer to the side. A caliper brake in which the main cable runs down the centerline of the bicycle, using a yoke to connect to a transverse cable. Technically, a normal cantilever brake is a form of centerpull brake, but the term is normally used to refer to caliper brakes only. This type of brake was popular from the late 1960's to the early 1980's, but is currently out of fashion. Centerpull brakes are a good choice for bicycles that have a long reach from the mounting point to the rim. In measuring distances between round things, whether they're tubes or holes, the usual method is to measure the distance from the centers of the circles. In the case of measuring bicycle frames, all measurements are assumed to be center-to-center except for the seat tube length. Seat tubes are sometimes measured from the center of the bottom bracket, but the upper end point may vary depending on the measurement system chosen. Center-to-center seat tube measurements measure to the intersection of the center of the top tube with the center of the seat tube. See also the entry on "Frame Size. " This is the French spelling of "center". It used to puzzle me that British writers used the French spelling, despite the fact that the syllable "re" has a totally different sound than "er." However, as it turns out, most Britons don't pronounce the "r" in this word anyway, so for them it's a phonetic non-issue. In the U.S., where we do pronounce the "r", the spelling "center" makes more phonetic sense than the French "centre." Popular bicycle brand in the 1980s. There is a featured article on Centurion bicycles on this site. Some aluminum rims are coated with a ceramic material primarily to improve wet weather braking, and to reduce rim wear that often results when rim brakes are used in muddy/wet conditions. The ceramic is fairly brittle, and if the rim gets dented even a little bit, the ceramic can flake off. If this happens, the braking will become very rough as the rim grabs/releases at the damaged section. Most bearing balls are super-hard steel. Lately, some suppliers have been promoting very expensive bearings that use ceramic balls. These are a silly gimmick, aimed at gullible cyclists with too much money. They have no real benefit in practical use on bicycles.